All you really need to know you learn in Kindergarten. * Take for example, "Make a New Friend Friday." You might think you don't care for prosciutto. You may assume you won't like shaved horseradish. But if you give them both a chance, you might be pleasantly surprised. 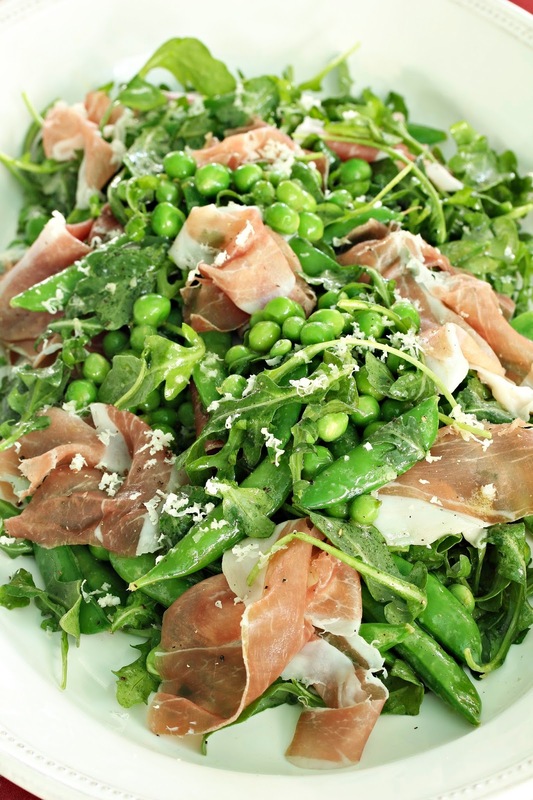 Bon Appétit featured a cooking video of a beautiful, easy English and snap pea salad last week. As English peas are a spring tradition on My Paleo Marin, I saved the video, but immediately started thinking of substitutes for some of the ingredients I assumed I didn't care for. I thought that Virginia ham, a taste from my childhood, might be a good substitute for prosciutto (which I had only tasted out of plastic packages). Online ordering of the ham didn't look feasible for several reasons, so I thought maybe a good butcher might have a tasty alternative. Belcampo sells their farm to table meats in stores, restaurants and online. 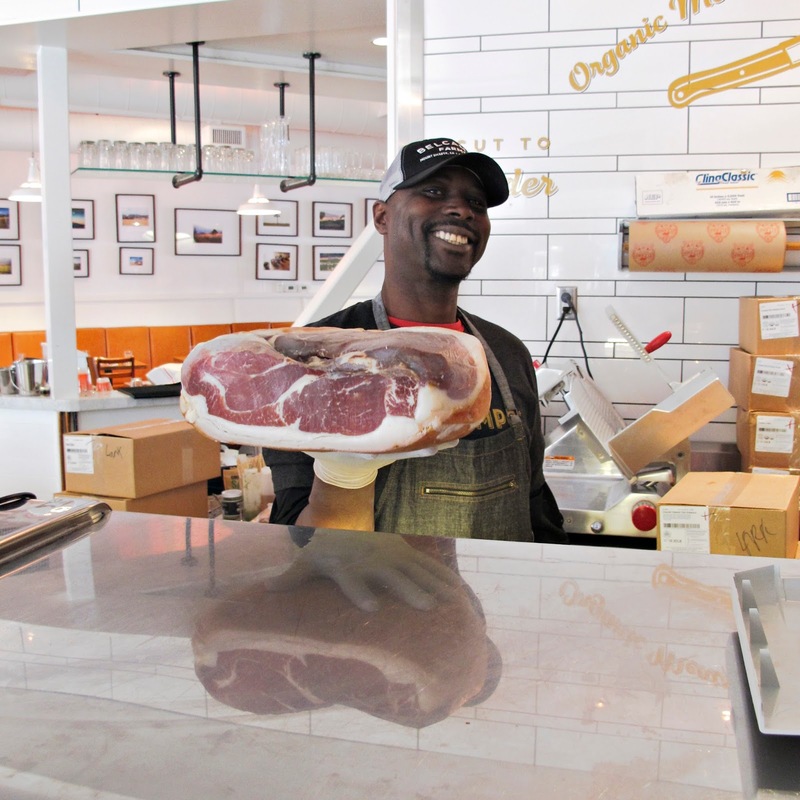 With a shop close by in Larkspur Landing, I headed over to try their ham. And right there, in the front of the meat case, was the most beautiful shank of prosciutto I've ever seen. I asked for a taste of that and the smoked ham. "Hands down," I said. "The prosciutto." It was dry with a very mild flavor of smoky meat, slightly reminiscent of Virginia ham without all the salt. I only needed a quarter pound - so that combined with fresh peas from our local Iacopi Farms at the farmers' market - would become the mainstays of the salad. All that was left to decide was whether to use parmesan or fresh horseradish for the garnish. I'd never tried the horseradish, but assumed it would have a harsh, bitter taste. I picked out the cheese, and then thought I'd at least check out the original ingredient. The video said markets usually have horseradish, you just can't recognize it from all the other root vegetables. I asked a team member to find it, and then cut in half the piece I picked out (as I didn't know if I would use it). Immediately, the aroma was magnetic - a light, peppery scent. It would be a perfect complement to the bitter greens and prosciutto, and a good substitute for parmesan in future dishes. Check out the video here for the recipe. It includes instructions for ordering a very cute apron for $20 as well as a suggestion to buy used olive oil bottles on Amazon with a pour spout for recanting your oil. Or, for a link just to the recipe, see Bon Appétit's “Pea and Prosciutto Salad" post here. *All I Really Need to Know I Learned in Kindergarten link here.